It’s not your everyday bumblebee, but a special “Transformers” edition, LT2, 2010 Bumblebee Camaro. Themed from the movie Transformers, this Bumblebee autobot is one cool ride. Tamara and her husband Greg are good friends, and when Tamara announced she bought this car, I had to photograph it. Much thanks that she agreed, and so we spent an afternoon photographing, here, in my studio/garage. It was pouring rain and miserably cold, so we were unable to do some planned rolling shots. Instead, I concentrated on details and made the best of the bad weather. This car has awesome lines and with patience adjusting lights, moving the car into position, I came up with some shots that I think turn an ordinary shoot into something much better and befitting of this car. Year: 2010 “Transformers” Camaro – US build quantity was 1,900 with 200 delivered to the Canadian market. It’s a type LT2: LT is marketing short for Luxury Touring and is used to identify high-optioned models. 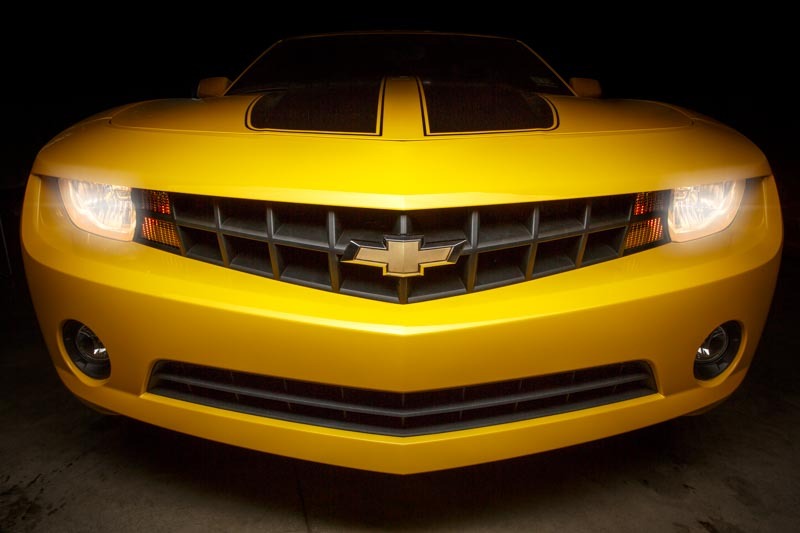 Colors: Yellow, black racing stripes, “Transformers” badges and a black leather interior. Engine: V6, DOHC, direct-injection w/variable-timing, 304hp @6400 rpm’s and 3.6-liter/220 cubic inches. This is a quick car. Mileage: EPA 18 mpg city/29 mpg highway. Impressive economy for a performance car. Transmission: 6-speed manual. Manual is more fun, period. Tires/Wheels: p245/50R19. Nineteen-inch tires are big, mounted on solid 19×8 polished billet Aluminum. Suspension: 4-wheel independent, MacPherson struts front, Coil over gas shocks multi-link rear. Stabilizer bars, front and rear. It doesn’t get much better than this. Weight: 3,872 pounds. This is heavy. Could benefit from a diet. Audio: AM/FM/Sirius XM/CD, Aux. audio input via USB, 9-speakers, Boston Acoustics Premium, total 245 watts. Yay. Comfort and convenience: Leather seats, leather shift and steering wheel, driver seat 6-way power adjust, heated seats, universal garage door opener, auto-dimming rearview mirror, power steering, brakes windows, door locks, reading lights, tilt-telescopic steering wheel, cruise control. Me like. Instrumentation: Classic style “meter” gauges, oil pressure, transmission temp, tachometer. I love old-style metered gauges, I hate digital. Telematics: wireless phone data link via bluetooth. I’m sure I missed something, but you get the idea. My fondness for Camaro’s goes back to high school. My first car was a 1974 Type LT Camaro, in Inca Bronze, with a 350 cubic inch v8 and I purchased it used in 1977. So glad I found these old Polaroids.